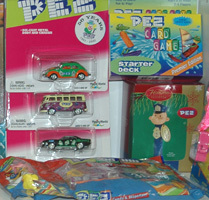 Three look a like Pez candy packs made in Germany. These peppermint candy Pez knock offs are almost the same size, but are a bit wider and will not fit in a Pez dispenser. German advertising on package.